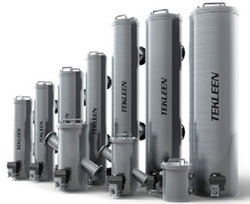 Saying that contaminants circulate through heat exchangers, chillers, and compressors, making the cooling system pump harder, thus lowering the efficiency of the system, Automatic Filters Inc, a US-based company has announced introducing its new line of Tekleen ABW (automatic backwash) filters. The manufacturer claims that the filters eliminate contamination caused by airborne dust, sand, pollen, algae, and pipe scales, thus reducing maintenance and operations costs. According to Automatic Filters, the product will be on display in booth 3626 at the 2013 AHR Expo, being held from January 28 to 30, 2013. Tekleen self-cleaning water filters provide the solution where dirty water is a problem. The filters operate on line pressure alone. The self-cleaning process is triggered by a pressure differential and is accomplished in seconds without interrupting the main flow. They are useful for the HVAC industry, especially in cooling tower applications. They come in stainless steel construction at carbon steel prices.